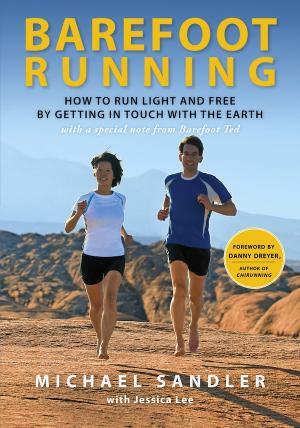 "Barefoot Running: How to Run Light and Free by Getting in Touch with the Earth"
"Enjoy the insights this book has to offer -- It is about form, joy and the love of running. Run Free!" - Micah True, AKA Caballo Blanco. As seen nationally on TV, radio and in print, Barefoot Running, an orginally self-published book, is the most comprehensive guide to barefoot running, written by best-selling author and running coach Michael Sandler, who has coached and inspired thousands of runners, walkers, and hikers nationwide. After a near-death accident left him with a titanium femur and hip along with 10 knee operations, no ACL, and an inch leg-length discrepancy, former professional athlete and Olympic hopeful Michael Sandler was told he could never run again. It was only by going barefoot and feeling the ground, he began to heal as he learned how to run light and free. He now runs pain free 10-20 miles a day and in all conditions. His step-by-step method helps runners overcome injuries, find their natural form and rediscover the pure joy of running, no matter their age, history, or fitness level. Co-Author Jessica Lee hated running and nagging knee pain and swore off running until the day she went barefoot. Now she helps women experience the joy of running barefoot (and pain free) nationwide. Written to help people get into running, back into running, or run pain free and at your best at any age, Michael Sandler's inspirational book and step-by-step guide is an easy to read bible of information and a must read for any runner. Barefoot Running is the how-to-guide that picks up where Christopher McDougall's inspiring book Born to Run left off. If you liked Born to Run, you'll love Barefoot Running. Topics include: Barefoot Running for Kids, for Seniors, choosing footwear, transitioning safely, cold-weather running and more.